Gives Your Brain Real-Time Feedback About Negative Brain Functioning So It Can Self-Correct. Neurofeedback is a sophisticated form of BIOFEEDBACK that optimises your brain and nervous system leading to improvements in COGNITION, PERFORMANCE and EMOTIONAL STABILITY. Over time, people who train with neurofeedback typically become calmer, happier, less anxious and more focused; their memory improves, they have more mental clarity and they show an improvement in their capacity to regulate their emotions. A quieter nervous system leads to a more relaxed individual who is less reactive, more content and more able to engage in relationships without conflict. Developed by psychologists and neuroscientists, NeurOptimal® neurofeedback is not a game nor a medical treatment: it is a superior form of brain-training that is safe for children and adults, enabling us to train the brain in the most extensive way currently known to neuroscience. During the session, five sensors are attached to your scalp and ears. The computer reads your brain's electrical activity and feeds this information back to your brain in the form of audible interruptions in the music (the feedback). This is how the brain learns — the central nervous system is hard-wired to take in information and use it to organise itself. With neurofeedback, the brain receives information about itself thousands of times more quickly than the brain can receive without neurofeedback when we learn about ourselves just by our interaction with the environment. The speed of the feedback received during neurofeedback helps the brain re-organise more efficiently. Training with neurofeedback STRENGTHENS THE BRAIN'S PROCESSING CAPACITY, which can lead to improvements in learning, memory, concentration, sleep and mood; as well as a reduction in symptoms associated with emotional distress, anxiety, depression, attention-deficit, fatigue and chronic pain. Neurofeedback actually TEACHES the brain to work more effectively - and, like learning to ride a bike, this learning is permanent. 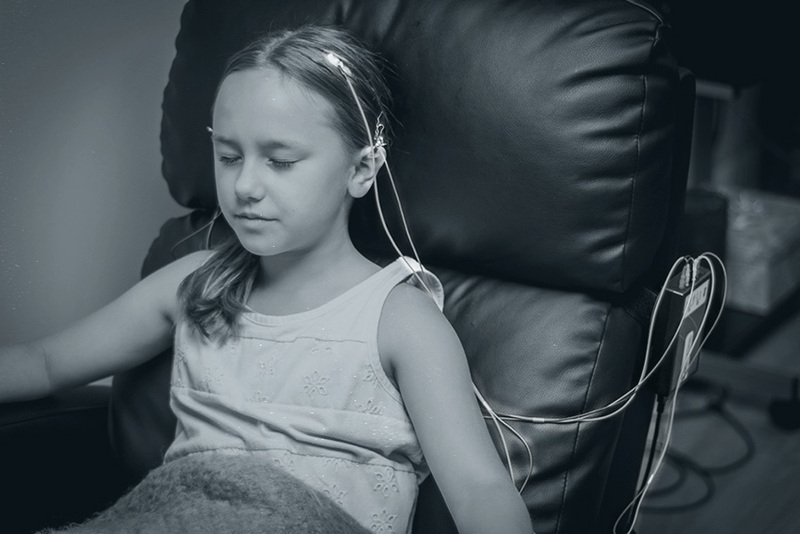 While neurofeedback can bring relief from a vast array of psychological and medical conditions, it is far from being a training process that only benefits those who are suffering. Because of it's ability to simultaneously improve FOCUS while training the nervous system to remain RELAXED, there has been an explosion in HIGH-FUNCTIONING CLIENTS around the world interested in exploiting neurofeedback's capacity to accelerate brain change to improve physical and mental performance. For professional athletes, when we are talking about hundredths of a point separating competitors, the MENTAL EDGE and EFFORTLESS MIND-BODY WORKFLOW that is developed through neurofeedback training can mean the difference between winning and losing! In a recent study of research scientists, brain-training with neurofeedback was demonstrated to improve insights and problem-solving abilities while decreasing anxiety and stress. Neurofeedback was also found to improve reflexes, hand-eye coordination, creative flow and consistency in performance in a group of high-achieving musicians at a performing arts school.